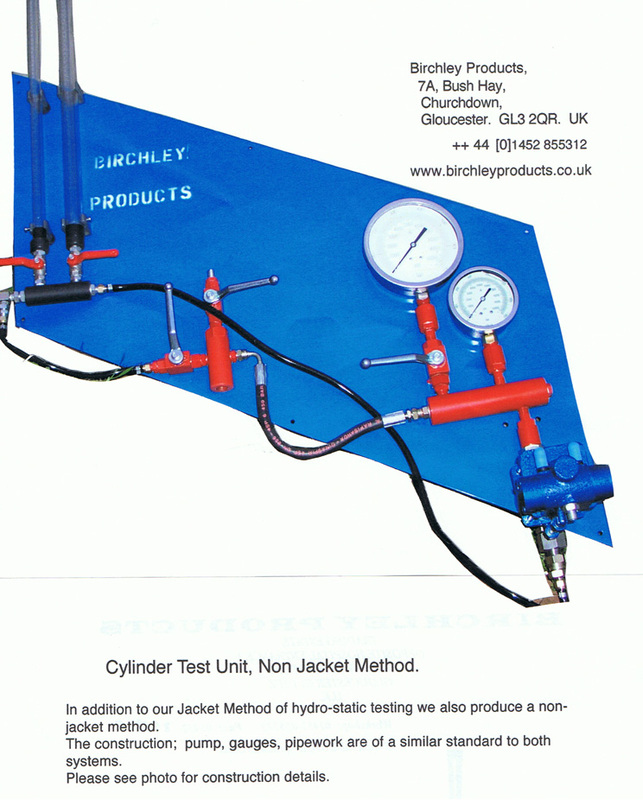 For the Hydro Static testing of diving and related HP Cylinders. We generally recommend the Jacket Method illustrated, but we also produce the Non Jacket Method. The construction is from rolled and welded steel plate. A domed lid is supplied for the easy venting of air from the system. Wing nuts are fitted as standard, but fast action cam clamps can be specified. It is sealed by an "O" ring. An Airhydropump provides the pressure to test the cylinder, an input pressure of 100 p.s.i. multiplies the pressure up to 10,000 p.s.i. Units may be wall mounted. Levelling or fixed burette method may be used for verification of temporary and permanent stretch. Small sight tube for highly critical results. Water in and out valves are fitted as standard. All that is required is a water supply, for pump and jacket, and a low-pressure air supply to begin use. Sizes and pressure requirements can be altered to suit customer requirements. Finished in Hammer Blue or to suit customer.